Many readers, especially those who are fans of the Nokia Lumia smartphones, will have heard of the Nokia Lumia 1020. Today we have some details of the Nokia Lumia 1025, which has been imagined from the Lumia 1020, but with Windows 8.1. It comes from one of the most prolific concept designers Bob Freking, and is an interesting take on the 1020. We like to bring readers details of concept phone designs from time to time as they can give us a good idea of what might be on offer with future devices, as well as what could have been if just a few aspects of a device had differed. Freking’s Lumia 1025 is a modified version of the Lumia 1020, noted for its hugely impressive 41-megapixel camera set-up. The Lumia 1020 runs Windows Phone 8 but this Lumia 1025 creation runs the full version of Windows 8.1. Other specs for this concept include an Intel Atom processor, a Full HD ClearBlack PureMotion HD+ display, and a PureView camera with Xenon flash, optical image stabilization, audio Rich Recording and Pro Cam app. The Lumia 1025 also features wireless charging and has a slim light aluminum build. As you can see from the image here, the Lumia 1025 has been tagged as “the ultimate smartphone.” We’d really like to hear what you think of this latest concept design by Bob Freking. 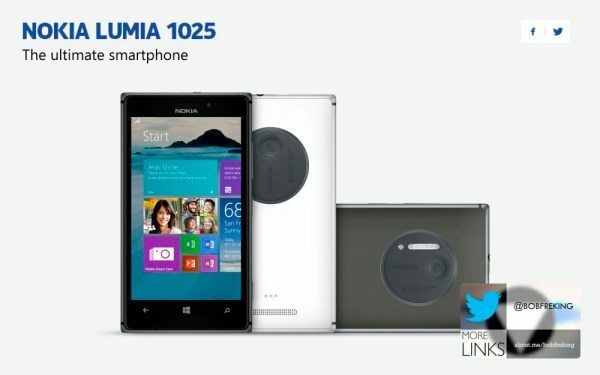 How do you feel about the Nokia Lumia 1025 envisioned here? Do you think there will ever really be a Nokia Lumia phone running Windows 8.1? Let us have your comments on this. This will be my next smart phone. Tired of the issues with my GS3. I think it’s just a matter of time. WP will take its rightful place in the os ecosystem. can barely wait for it 🙂 – amazing phone!